A whimsical heart-shaped needlepoint design by Danji Designs. The design is handpainted onto 18 mesh needlepoint canvas and measures approximately 2.5" x 2.5". This lovely heart-shaped needlepoint design could be sewn onto a pocket or garment as a patch or decoration, or made into an ornament. 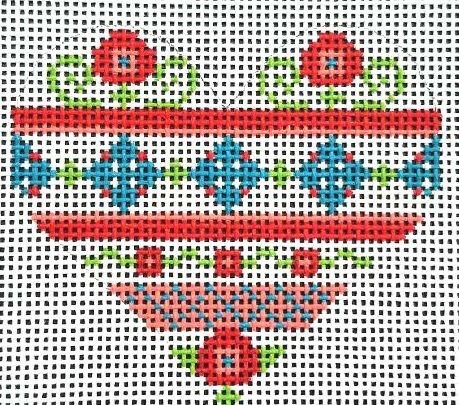 This whimsical needlepoint design comes with or without fibers. If you select cotton we will send DMC cotton floss. For silk we use Planet Earth Pepperpot boutique fibers which are single-ply for 18 mesh and easy to stitch with. Usually ships in 1-5 days. If it is going to be delayed you will receive an email. Please notify us if you need it within a specific time frame. Please contact us with any questions about this or any of our other needlepoint designs. We're always happy to help. You can email us or call us on 877 722 8463.